4 Http://www.applied-software.com © Prasad Bodepudi. All rights reserved. 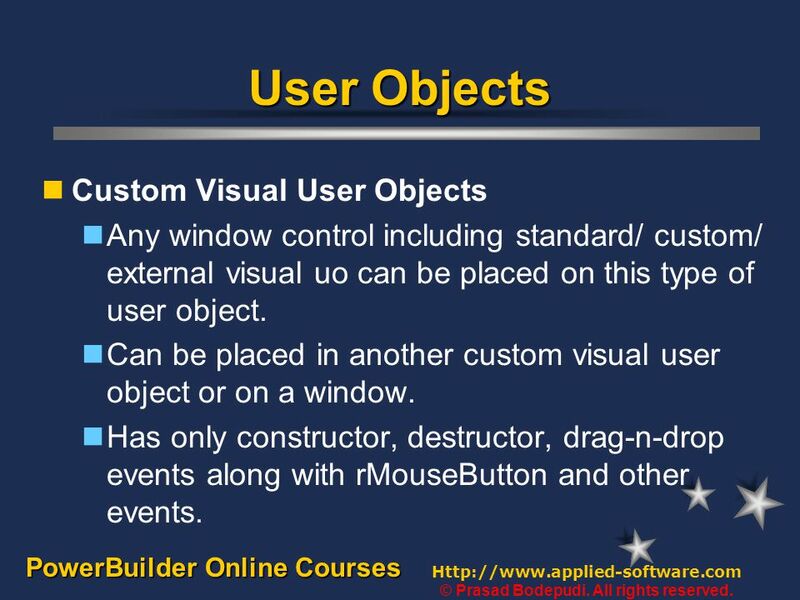 PowerBuilder Online Courses User Objects Standard Visual User Objects Includes all window controls. 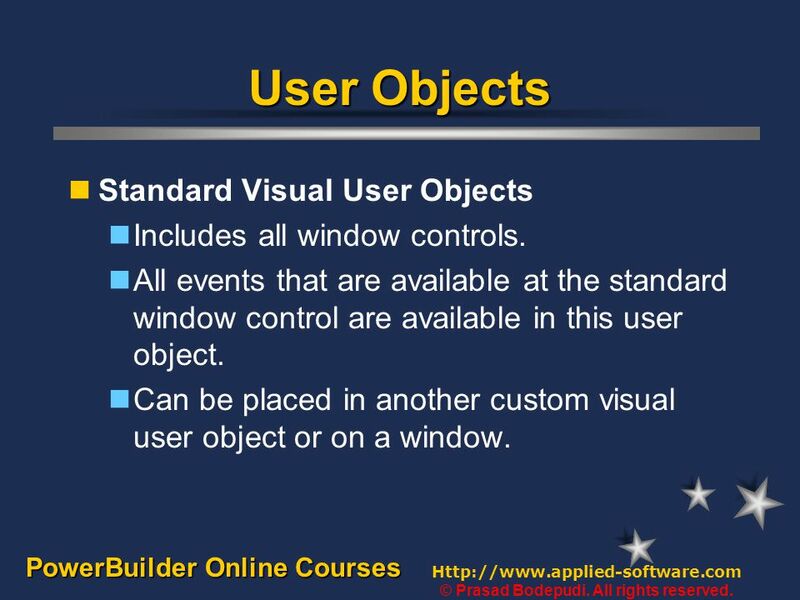 All events that are available at the standard window control are available in this user object. Can be placed in another custom visual user object or on a window. 5 Http://www.applied-software.com © Prasad Bodepudi. All rights reserved. 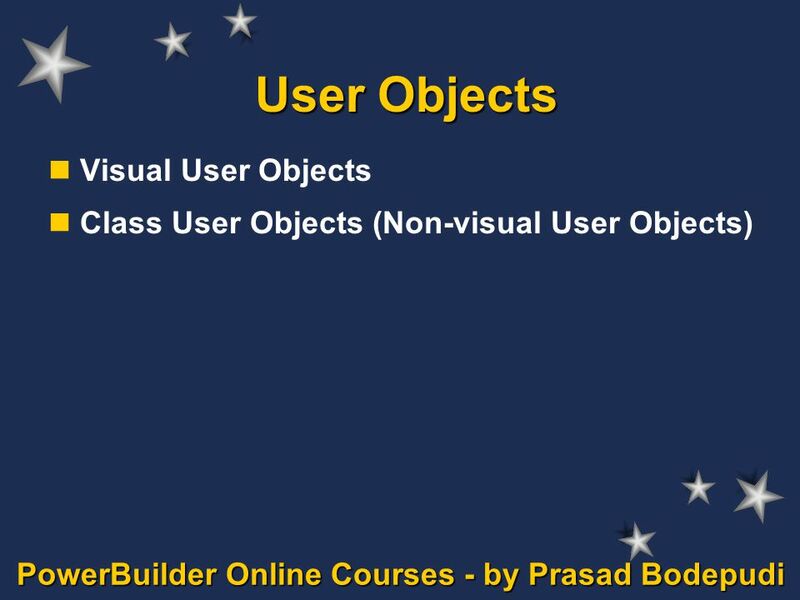 PowerBuilder Online Courses User Objects Custom Visual User Objects Any window control including standard/ custom/ external visual uo can be placed on this type of user object. Can be placed in another custom visual user object or on a window. Has only constructor, destructor, drag-n-drop events along with rMouseButton and other events. 6 Http://www.applied-software.com © Prasad Bodepudi. All rights reserved. 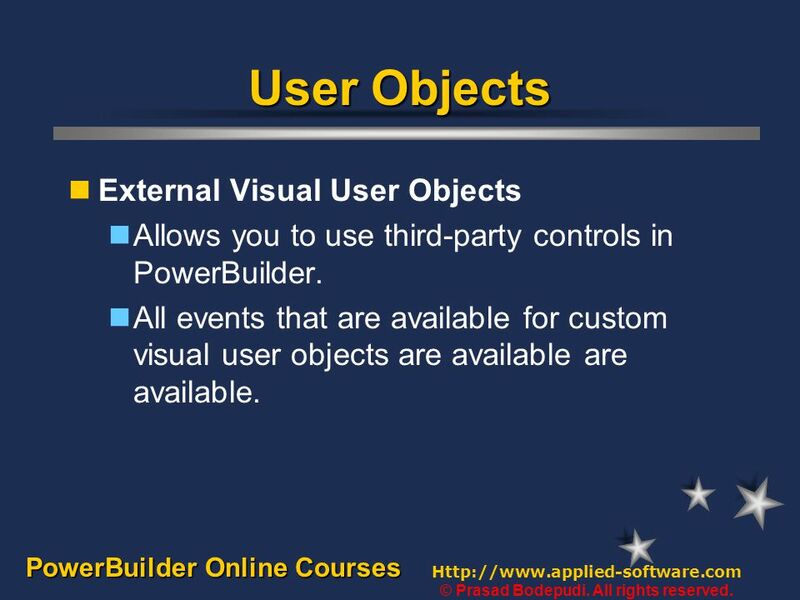 PowerBuilder Online Courses User Objects External Visual User Objects Allows you to use third-party controls in PowerBuilder. 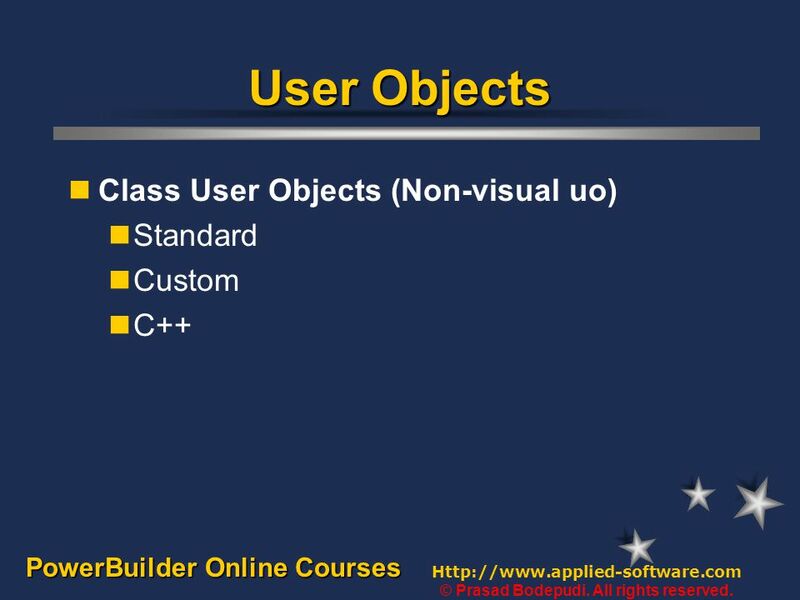 All events that are available for custom visual user objects are available are available. 7 Http://www.applied-software.com © Prasad Bodepudi. All rights reserved. 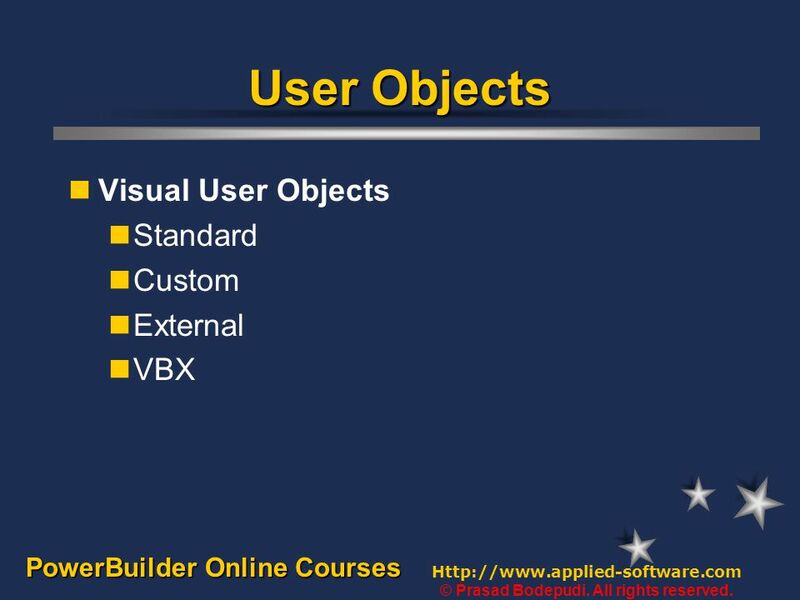 PowerBuilder Online Courses User Objects VBX Visual User Objects Allows you to use VBX (Visual Basic) controls in PowerBuilder. VBX controls are supported only till v4.0. 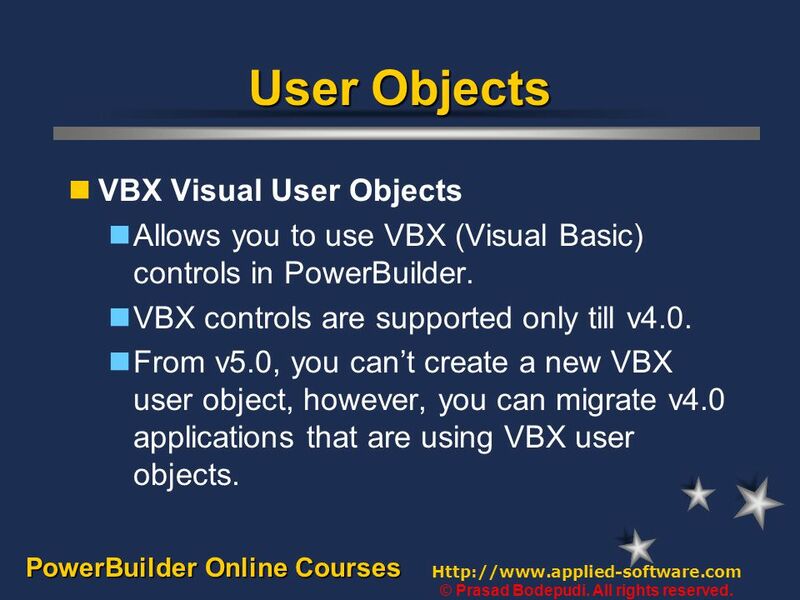 From v5.0, you can’t create a new VBX user object, however, you can migrate v4.0 applications that are using VBX user objects. 10 Http://www.applied-software.com © Prasad Bodepudi. All rights reserved. 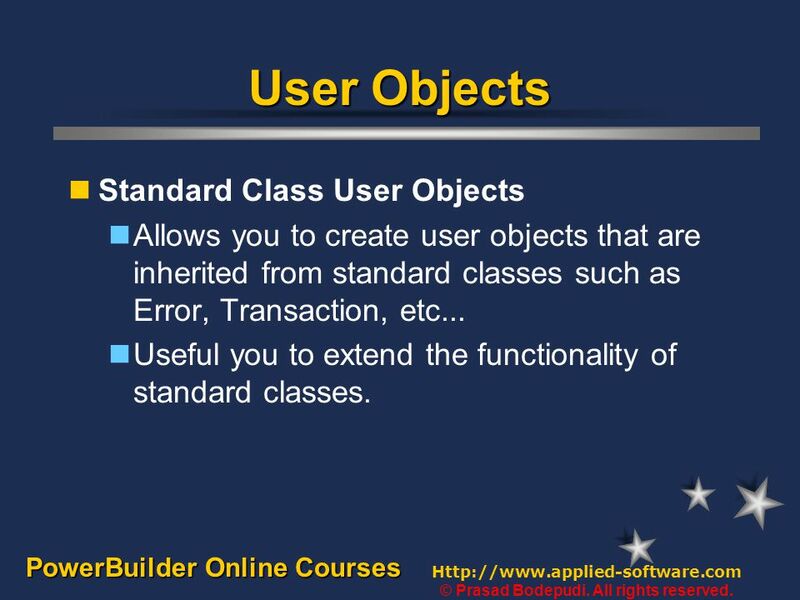 PowerBuilder Online Courses User Objects Standard Class User Objects Allows you to create user objects that are inherited from standard classes such as Error, Transaction, etc... Useful you to extend the functionality of standard classes. 11 Http://www.applied-software.com © Prasad Bodepudi. All rights reserved. 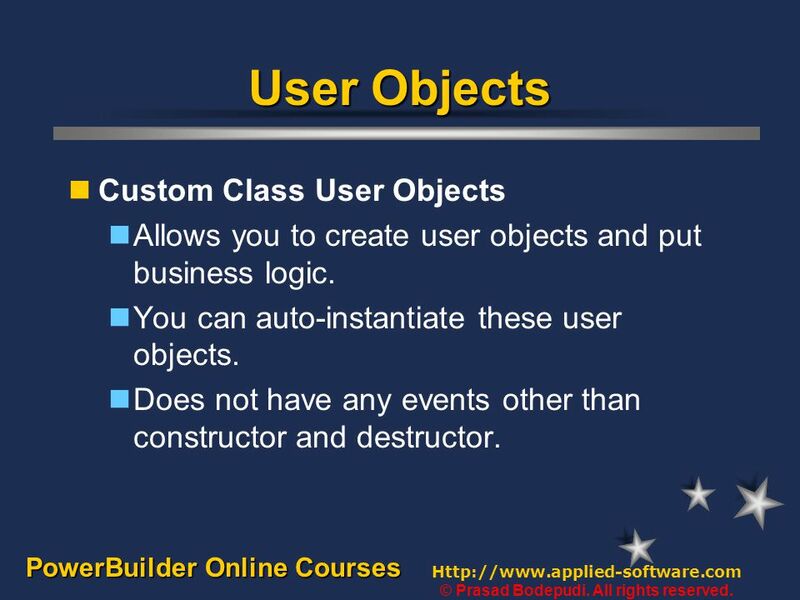 PowerBuilder Online Courses User Objects Custom Class User Objects Allows you to create user objects and put business logic. You can auto-instantiate these user objects. Does not have any events other than constructor and destructor. 12 Http://www.applied-software.com © Prasad Bodepudi. All rights reserved. 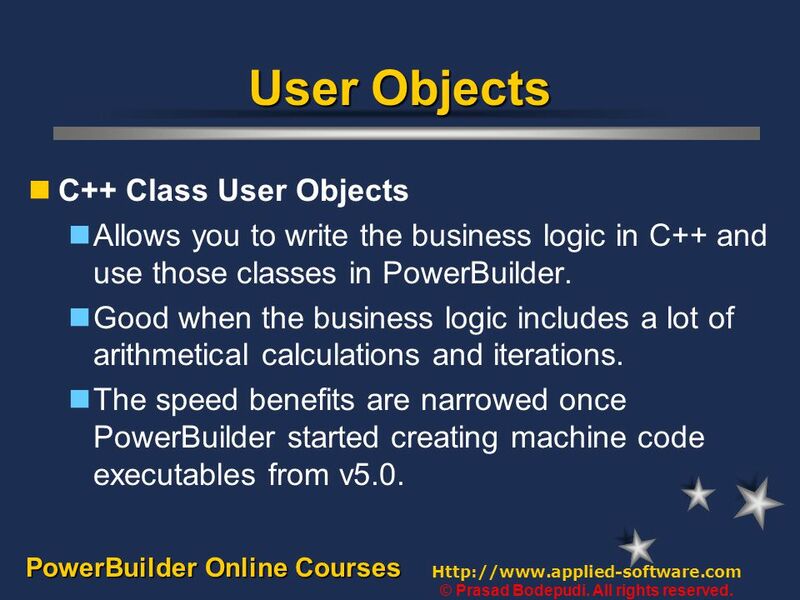 PowerBuilder Online Courses User Objects C++ Class User Objects Allows you to write the business logic in C++ and use those classes in PowerBuilder. Good when the business logic includes a lot of arithmetical calculations and iterations. The speed benefits are narrowed once PowerBuilder started creating machine code executables from v5.0. 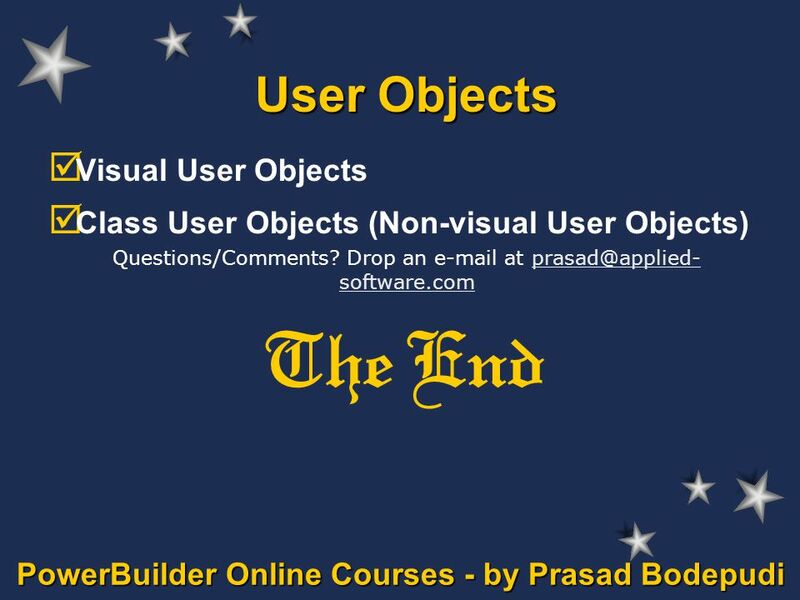 Download ppt "PowerBuilder Online Courses - by Prasad Bodepudi User Objects Visual User Objects Class User Objects (Non-visual User Objects)"
Introduction to Online Courses (click on each page to continue) Welcome to the The Equine Sciences Academy. The best source for career based education. Designing InfoPath Forms: The Dos and Donts Deploying InfoPath Forms: Making the right choice Adding custom business logicin case the built-in stuff isnt. ST/PRM3-EU | | © Robert Bosch GmbH reserves all rights even in the event of industrial property rights. We reserve all rights of disposal such as copying. Web Programming Language Week 6 Dr. Ken Cosh PHP Functions & Objects. Attributes of SharePoint Migration  Quickly Migrate bulk SharePoint offline or Online database in other SharePoint or Office365.  Transfer Multiple. Improving your OpenEdge® Development Productivity David Lund Sr. Training Program Manager, Progress. PowerBuilder Online Courses - by Prasad Bodepudi Menu Painter Menu Types Menu Properties. Engineering Problem Solving With C++ An Object Based Approach Fundamental Concepts Chapter 1 Engineering Problem Solving. Java Programming, 3e Concepts and Techniques Chapter 5 Arrays, Loops, and Layout Managers Using External Classes. 1 Engineering Problem Solving With C++ An Object Based Approach Fundamental Concepts Chapter 1 Engineering Problem Solving.